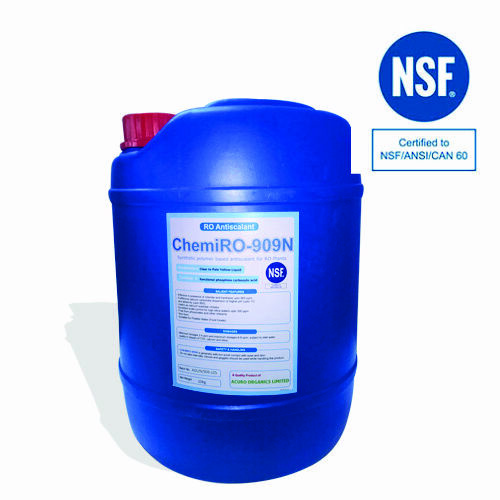 Chemiro 909N is a synthetic polymer based antiscalant, used in RO membrane systems. This material features thermally and hydrolytically stable properties. It exhibits multifunctional scale control and dispersancy in affected surfaces. It is immensely excellent in calcium phosphate, calcium carbonate, silicate and iron oxide scale dispersancy. We offer CHEMIRO 909N, an NSF Certified, Food Grade RO Antiscalant. It is an economical grade RO antiscalant, formulated with a specified blend of superior ingredients.